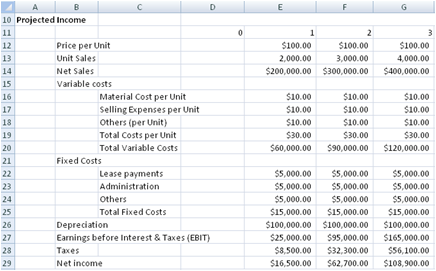 This spreadsheet values a company's share price by using the Free Cash Flow to Firm of a 10 years projection horizon. The Free Cash Flow to Firm is defined as the sum of the cash flows to all claim holders in the firm, including equity holders and lenders. The terminal value of the firm beyond the projection horizon is also estimated and added to the cash flow. The final cash flow discounted with the cost of capital provides a value of the operating assets. By adding the value of the non operating assets and deducting the value of debt, the equity value is derived. Discount Rate - Weighted Average Cost of Capital. This is used to discount the cash flow to firm. Value of Non Operating Assets - The Discounted value of the Free Cash Flow to Firm yields the value of the operating assets. The equity value can be derived by adding the value of the Non Operating Assets and deducting the value of debt from the value of the operating assets. Value of Debt - The Discounted value of the Free Cash Flow to Firm yields the value of the operating assets. The equity value can be derived by adding the value of the Non Operating Assets and deducting the value of debt from the value of the operating assets. This section uses the value from the Net Working Capital, Investment (Capital Spending), EBIT and Depreciation to calculate the Free Cash Flow to Firm.